Theri, Vijay’s 59th film due for release on April 14 is creating a tussle between the distributors and theatre owners in districts outside Chennai. The past few weeks has seen Vijay’s latest Theri break records and whip up controversies. Scheduled for a release on Tamil New Years’, Theri is projected as Vijay’s magnum opus after the disappointing ‘Puli’ that managed to neither win over fans nor the box office. Sources say that the initial snag with distributors choosing not to approach all theatres with the movie was owing to Puli’s dismal run, which even fans couldn’t save. There’s even a term for this doing the rounds – ‘Puli’tics. But this project is said to be particularly close to Vijay’s heart. 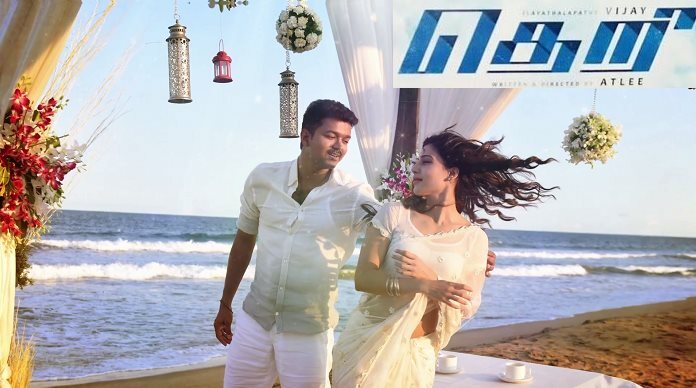 Theri has been bought for astronomical price by distributors. In Coimbatore, the second biggest film business market and having a good number of multiplexes, Theri was sold for Rs 8 crore. The film was sold similarly for record prices in other areas. Distributors were in for a shock after theatre owners decided to stick to Government fixed admission charges. The highest price of a ticket is Rs 120. Tickets through online mode were sold for Rs 300 by theatres. The bookings were opened a month ago online. City theatres are having a month-long house full booking. The Government decided to enforce the ceiling on ticket rates. This rule was not followed by exhibitors. First weekends saw more collections for big-ticket films. Gradually as weeks went by, the rates dropped to normal . Most of the theatres have given the online sales to web portals,who charge money for services like home delivery of tickets. There have been complaints that cancellation of tickets are not honoured by the theatres and refunds hard to get. Madras High Court has ordered Chennai City Police Commissioner to monitor over-priced tickets in Chennai. Reportedly, the Police Commissioner has appointed special teams including an assistant commissioner, commercial tax official and revenue official to monitor the cinemas in Chennai and nab ticket scalpers. The Government has now put up a helpline for movie goers to report about tickets being sold above the prescribed rate. This helpline was intended for Chennai. Now calls from other districts are coming and tax authorities are forwarding the complaints to district authorities. Flying squads have been set up to monitor the theatres. Distributors have been told that exhibitors cannot take risks and jack up prices to please them. This has worried the distributors of Theri. Many theatres including Ganga, Kaasi, Vettri and Raaki theatres had reportedly closed pre-bookings and cancelled shows. “Kaasi and a few other theatres have marked its prices up to 500 rupees as it always does for any Rajnikanth, Ajith or Vijay movie, and is refusing to show the film if ticket prices are lowered. For the government to raise the 30% tax cut issue, which is a minimum guarantee for any film with a Tamil title, and crack down on ticket prices, it seems a bit fishy,” a source said, adding that Ajith’s Yennai Arindhaal was the last film to face government intervention on a relatively lesser scale. Morning shows were cancelled on a large scale citing security reasons. Some theatres have stopped issuing online tickets and instead issue coupons that can be exchanged for tickets at the counter paying the increased price. But in Southern districts of Tamilnadu the tickets are sold for an average of 300 to 500 Rupees. Theatre owners says they are being told by the distributors to sell for the price so they can mint money from the opening day, when inquired. Meantime, Vijay 60 directed by Bharathan and produced by Nagi Reddy Productions was launched today at EVP Studio. Keerthy Suresh is the heroine. Music is by Santosh Narayanan. Vijay will join the shoot after the first schedule as he is to tour the State for promotion of Theri. How much did you buy the tickets for the movie? Let us know in the comment section.